If the device is responsive and can be powered on, the preferred reset method should be performed. Attempt to sign in with any Google account previously used on the device. While continuing to hold volume down, press and release the Power button but continue to hold volume down until the boot mode screen appears. 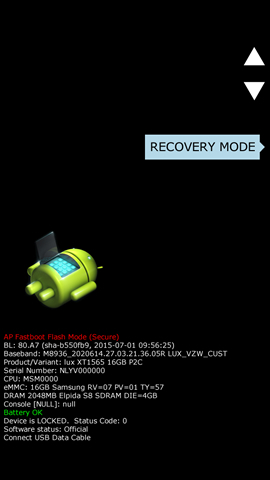 From the Bootloader selection screen (image of an Android with Start), select RECOVERY MODE. Ensure the steps below are performed in a timely manner. If power is held too long (longer than 5 seconds), the device resets. While continuing to hold the power button, press the Volume Up button then release all buttons. Select Wipe data/factory reset then from the confirmation prompt select Yes. 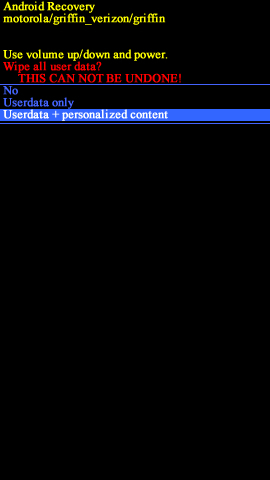 Select Userdata + personalized content.